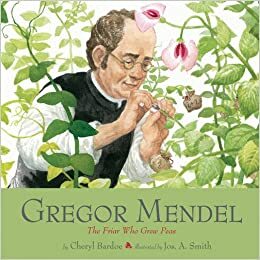 Gregor Mendel was an Augustinian Friar and Abbot, who is best known for his pioneering work on genetics and plant breeding. His experiments in breeding different varieties of peas illustrated laws of heredity and genetics, which later proved highly influential in the development of new strains of plants and animals. It was Mendel who was the first to highlight the role of recessive and dominant genes, which explain how certain characteristics, such as colour can skip a generation, but appear at a later date. Mendel published his work in 1866, but it was not until the early 20th Century, that his laws were rediscovered and he became widespread in the scientific community. Publishing his results as an Augustinian Friar there was little interest in his results and most contemporaries failed to see the significance of his work. Mendel was well ahead of his time. 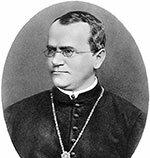 Gregor Mendel was born in Hyncice, then part of the Austrian Empire (now modern Czech Republic) on 20 July 1822. His parents were farmers and Mendel was brought up on the family farm where he learnt gardening and beekeeping. He studied at a school in Opava and later philosophy and physics and the University of Olomouc. However, his studies were marred by ill health and a shortage of funds to pay for them. Partly due to insufficient finance, he chose to become a friar – which enabled him to receive a free education. Mendel entered the Augustinian St Thomas’s Abbey in Brno, where he began his training as a priest. He also worked as a substitute teacher, though on two occasions he failed the oral part of the exams to gain a teaching certificate. Encouraged by his teachers at the University and his abbot C.F. Napp, Mendel began to study variation in plant breeding. He was given free reign over the monasteries extensive (5 acres) gardens. Mendel was not the first to test the cross-breeding of animals or plants, but Mendel brought a systematic approach and methodical recording of all characteristics from year to year. Between 1856 and 1863, he cultivated approximately 28,000 plants – most of them the common garden pea. The most striking finding was how breeding two true varieties, caused a predictable mixing of characteristics. Two out of four were hybrids. One out of four carried a recessive trait from one of the parents and one out of four carried a dominant trait from one of the original varieties. A regressive trait meant, that a colour may disappear from the child plant, but in the next generation, this recessive trait could reappear. In other words, although a new plant may have yellow seeds, it still contains a genetic factor which enables blue seeds in the future. Mendel called these genetic traits ‘factors’ – as the term genetics had not been discovered. Up until Mendel, breeding of different varieties had tended to be based on rough trial and error. However, Mendel’s careful recording enabled him to make two generalisations. The law of segregation and the Law of Independent Assortment. These were later known as Mendel’s Laws of Inheritance. At the time, the common perception was that crossing two varieties tended to cause a blending of different characteristics and the new plant would ‘average’ the characteristics of their parents..
Mendel published his paper “Experiments on Plant Hybridization” at the Natural History Society of Brno on 8 Feb and 8 March 1865. It received local interest, though it was largely ignored by the scientific community, who did not recognise the significance of this new work on inheritance and genetics. Whilst Charles Darwin was developing his theory of natural selection and evolution; he attempted to form his own theory of genetics, which was called pangenesis. If Darwin had been aware of Mendel’s work, genetics may have been accepted much earlier and could have helped Darwin’s theories. Mendel also did some work initially on breeding mice, though his bishop did not approve of studying animal mating, so this was dropped. He also tested the crossing of bees, though the results of this breeding programme does not survive. As well as a keen gardener, Mendel was very devoted to his bees, even though visitors to the monastery complained about the aggressive behaviour of the bees. After publication, Mendel’s work largely faded from public interest and he became discouraged by the lack of acceptance. He corresponded with the biologist Carl Naegeli, but Naegeli was never able to appreciate the work of Mendel. At the age of 61, Mendel passed away on 6 January 1884 in Brno (now the Czech Republic). He died from an inflammation of the kidneys. For 16 years, Mendel’s work remained obscure. However, in 1900, Hugo de Vries and Carl Correns pursued independent research into inheritance and replicated the results of Mendel. Reading Mendel’s work and theories may have helped them to understand their results. They published similar findings and gave credit to Mendel’s original work. Around that time, there were three researchers all publishing the rediscovery of Mendel during the spring of 2000. As a result, other biologists gave much greater interest to modern genetics as a separate science. William Bateson an English biologist became a powerful populariser of Mendel’s theories and he was the first to use the term genetics. Bateson directed a new embryonic school of genetics at Cambridge. It consists of many female scientists associated with Newnham College, Cambridge. In 1936, R.A. Fischer, a prominent statistician, argued that the results of Mendel’s experiments were ‘too good to be true’ and argued it was likely Mendel had falsified his results to remain true to his hypothesis. However, redoing the experiments results in similar results, showing there is no real bias in Mendel’s data. Citation: Pettinger, Tejvan. “Gregor Mendel Biography”, Oxford, UK. www.biographyonline.net. 15th September 2018. 100 most influential people – A list of 100 most influential people as chosen by Michael H. Hart, from his book 100 most influential people in the world. Includes; Muhammad, Jesus Christ, Lord Buddha, Confucius, St Paul and Johann Gutenberg. Famous Scientists – Famous scientists from Aristotle and Archimedes to Albert Einstein and Charles Darwin. Including mathematicians, biologists, physicists and chemists.